Panic equates to profit, sending thousands of dogs to emergency clinics to be diagnosed and treated for unproven, untested, unstudied raisin-grape poisoning. Dogs are 10,000 times more likely to die in surgery than by "Killer Grapes". 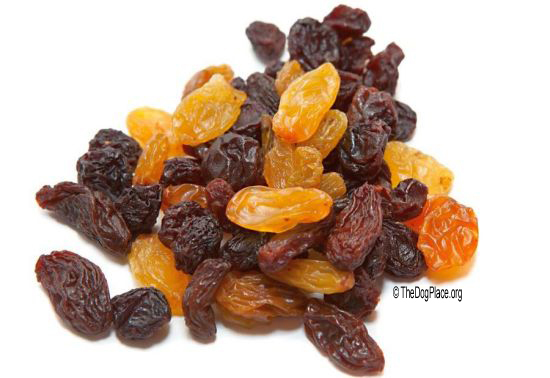 Most raisin and grape toxicity reports refer to the National Animal Poison Control Center, a $60 per call ASPCA service. The Animal Poison Control Center was a free service started by a veterinarian and his students at the University of Illinois - Urbana. In 1984 the name was formally changed. In 1990 Paul Harvey gave out the phone number on his radio show and for the first time, a small per-call fee was instituted. In 1996 the ASPCA acquired the Animal Poison Control Center (APCC) call center and instituted a $60 per call charge, payable by credit card. ASPCA is a New York City charitable organization, not connected with your local “SPCA”. It relies on donations but unlike HSUS which does not have or support a single shelter, the ASPCA maintains a highly rated shelter facility in New York City. The ASPCA Animal Poison Control Center has an aggressively marketed database. If a dog is presented with symptoms that a vet recalls match those associated with “killer grapes” (a term used by APCC), the vet will ask if the dog could have eaten grapes. A distraught, confused owner may well answer “yes, he could have” and thus, it is dutifully recorded as another grape-raisin poisoning. If it fact is was an adverse reaction to medication or a vaccine, your dog can die if treatment is not appropriate. Beloved pets have died because good vets were misled. If time allows, conscientious vets will pursue diagnostic testing but far too often, dogs will be hospitalized and treated for “grape and raisin poisoning.” Whether the dog survives or not, it becomes another incorrect statistic with which other vets and dog owners may be misled. 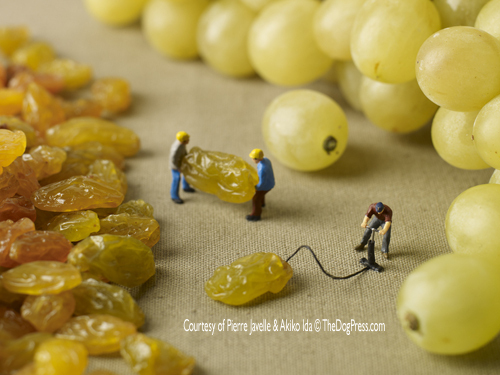 A pound of grapes would give a 200 pound human diarrhea for a week! On the other hand, APCC says a single grape can cause renal failure. Equally ridiculous. The statement implies widespread raisin/grape toxicity but that is patently untrue. 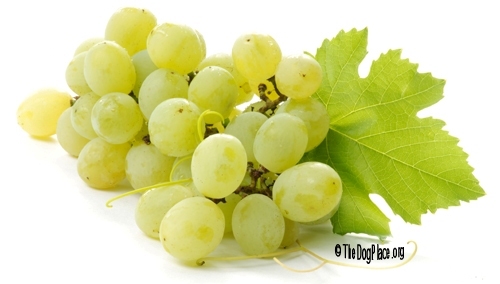 How many cases have actually been attributed to dogs known to have ingested grapes? APCC has no answer! Have other species been poisoned as is implied by “canine cases”? No answers. “Killer grapes” is a classic example of “give a fool a fable and it becomes a fact” by virtue of repetition. It might be funny were it not making fools of good vets and causing dog owners to withhold a natural treat loved by most dogs. Test your gullibility IQ with this quick example of Veterinary Overstatement excerpted from the Vermont Veterinary Medical Association, editorial emphasis added. Q: I recently heard that I should not give my dog grapes or raisins, as this could be fatal. Is this true? A: Yes, it is. According to the National Animal Poison Control Center, pets may be very sensitive to an unknown chemical in grapes, raisins, or juice/wine made from grapes. 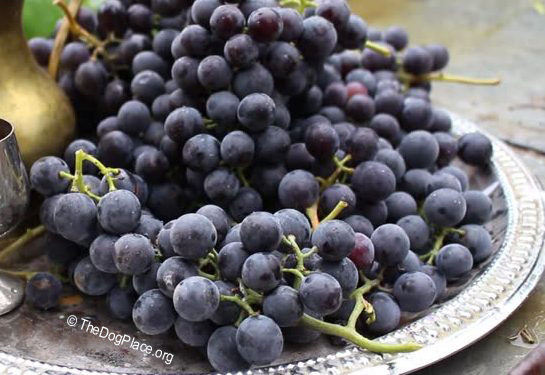 The toxic dose of grape products can be as low as 0.1 mg/kg (or 0.046mg/lb), which means less than one grape or raisin may be poisonous to a 10 pound dog. Older or sick animals are the most susceptible. Symptoms usually start with vomiting, diarrhea and/or depression. In the animal hospital, several blood tests values will be affected, especially kidney function tests. Without intensive supportive therapy, death from kidney failure usually occurs within one to four days. 1.) The number and frequency of such reports and the basis for diagnosis of grape poisoning as opposed to known chemical toxins used to treat the grapes or Adverse Drug Reactions which are a hundred thousand times as likely! 3.) If the number and frequency of renal failures put forth by APCC is accurate, why hasn’t a veterinary university done a study? Is it because there is no marketable vaccine, medication, or antidote for “grape” poisoning or is it because there is simply no evidence with which to indict the grape and thereby motivate a clinical trial? 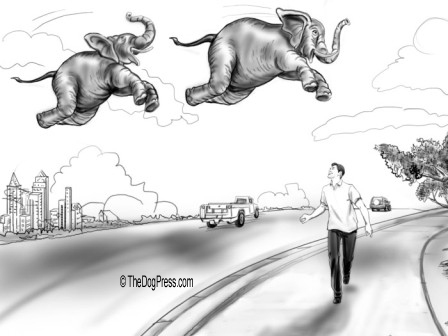 See Adverse Reactions. 4.) And lastly, does this whole scenario set up a situation for intense hospitalization, extensive testing, and expensive treatment based on a false diagnosis which no grateful dog owner will question? I am not a veterinarian but I have, for 51 years, unknowingly conducted a real-life clinical trial with real dogs, none of which have ever suffered any adverse effects from eating grapes. To be accurate, I must confess I’ve fed unwashed grapes to my dogs. My dogs have varied in size from 2 pound toy breed puppies to well over 100 pound adult Rottweilers and Akitas. Depending on their size, my dogs lose interest after 3 to 7 grapes. This leads me to the inescapable conclusion that the dogs taken to veterinary clinics were owned by heartless people who starved them so badly that the dogs overdosed on grapes! Wild grapes are part of a natural diet for foxes, wolves, coyotes, and bears. Sprayed, commercially raised grapes are stolen by various carnivores and birds. I do not however confuse grapes with raisins which are preserved with sulphur dioxide and other chemicals. If grapes are found in a dog’s stomach that died from “poison” it is statistically more likely that the dog was inadvertently poisoned by household chemicals, instant information on ii Anti-freeze Poisoning or suffered an Adverse Drug Reaction that is (inadvertently or deliberately) overlooked. This is in no way meant to detract from conscientious, caring vets who accepted what they assume is scientific evidence. It is not meant to demean the good work done by the ASPCA. We just wonder if anyone at APCC has ever owned a dog much less given it a grape! This first report went out to over 19,000 subscribers and within 30 days was read by more than 20,000 interested dog owners. As of this writing, we have received one report of death by grapes, over two hundred emails of grapes routinely given as treats, and nearly one hundred reports of veterinary negligence and/or malpractice unrelated to grapes. Please, if you have a confirmed report of grape toxicity or can add to this discussion, email the editor. Adverse Drug & Vaccine Reactions, the 5th most common cause of death in HUMANS! Get the facts. As a veterinarian, I'd like to share information with your readers. Recalls continue but APSS denies food-related problems. ASPCA Poison Control says poisonous, breeders refute!